Have you ever carried a 5-gallon bucket full of water? One gallon of water weighs about 8 pounds. Carrying a full bucket is at least 40 pounds and for most people that is way too much to carry. For one, it’s just heavy and hard to lift off the ground. For two, because it’s heavy even if you do lift it off the ground you’ll likely spill some as you try to walk awkwardly with the bucket at your side. I’ve tried to carry numerous 5-gallon buckets in my life. For some project around the house. For all kinds of things. The biggest temptation is to fill that bucket to the top and try not to spill or fall while carrying it do the destination. But the last time I was carrying a bucket and spilling and falling all over myself I realized something, I’m much better off filling the bucket about halfway than I am filling it to the top. When you fill the bucket about halfway you can walk normally. You still get about 2 or 3 gallons of water to your destination and you do it quickly and efficiently. On the flip side, though, is the other temptation. It might seem like if you can do well with only a half-full bucket that a nearly empty bucket would be even better. But that’s not the case either. If you carry just one gallon you still walk about the same as you would with 2 or 3. So you have to make many more trips to get water to its destination. A half-full bucket is the way to do it. Temptation is everywhere. The kind of temptation I’m referring to is the number of opportunities we have. Work, hobbies, activities with friends and family. There are all kinds of things that we can do in life. And the trouble for many of us is that we try to do them all. It’s not right. 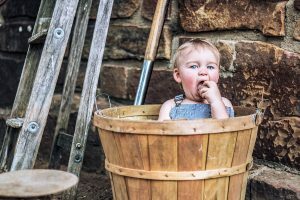 When your bucket is filled to the top and you’re busy you’re going to be doing a lot of things, but not really doing any of them well or at a level that you’re enjoying them to the fullest. The opposite isn’t good either. A bucket that is nearly empty leads to disappointment. You feel like you’re not living to your fullest potential. Maybe you’re paralyzed by the opportunities you have. You’re not sure what to fill your bucket with so you don’t do anything. And as a result you don’t accomplish anything. Assess your life and figure out how full your bucket is. Are you too full or too empty? If you have too much, look to remove some water. If you don’t have enough, look to add. Then set a reminder to do the same in a year and for every year after that. Half full. It’s the best way to get water where it needs to go.